The use of sexagesimal numbers for astronomy by the Babylonians in the last centuries bc gave them a great advantage over contemporary Greek astronomers who had no convenient mathematical notation. As a result many Babylonian astronomical calcu- lations were used by the ancient Greek and medieval Arab astronomers long after knowledge of cuneiform writing was lost. Our present base 60 system of counting sixty seconds in a minute, sixty minutes in an hour, and three hundred and sixty degrees in a circle is a survival of Babylonian mathematics. Write your name in cuneiform ! The top line is the cuneiform symbols for the name Gilgamesh. 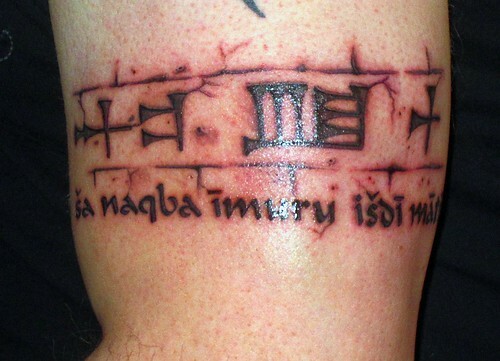 The bottom line, "�a naqba imuru i�di mati," is the first line, reconstructed and transliterated in Akkadian, for the Standard Babylonian Version of the EPIC OF GILGAMESH. Translated by Andrew George, it reads "He who saw the Deep, the country's foundation."